Chemicals used for more than 60 years in paper, carpet, furniture, clothing, cardboard and Teflon are showing up in the eggs of Great Lakes birds, according to a recent study. The 20 year study, published in November by Canadian Great Lakes researchers, is the first ever of the presence of poly- and perfluorinated compounds in Great Lakes wildlife. The man-made contaminants known collectively as PFCs continue to rise in Great Lakes herring gulls. The results surprised researchers because the U.S. EPA asked major manufacturers to reduce the use of the chemicals by 95 percent by 2010 and eliminate the emissions and their products completely by 2015. “With the phasing out of the compound, you’d start to see them go down but clearly there are many sources,” said Robert Letcher, a research scientist at Environment Canada and the study’s co-author. 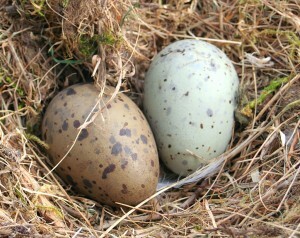 More puzzling, the eggs are more contaminated than the birds that lay them. Here’s why: Most energy and food consumed by the mother is transferred to the egg. PFCs are unique in that they attach to protein rather than fat. The yolk in a developing egg is almost all protein. Herring gulls were not chosen by random to study. The researchers believe that the birds share significant characteristics with people. If the chemicals are toxic and eventually cause health problems for herring gulls, it will likely do the same to humans, Letcher said. 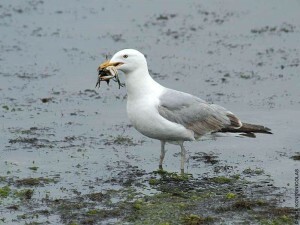 Herring gulls symbolize an epidemic of contaminant exposure. With PFCs continuing to rise in wildlife and potentially humans, the obvious question is: What are the health costs? 3M states on its website that the chemicals were, “widely dispersed in wildlife around the world and are detected at low levels in people.” The company also reports that extensive research shows no adverse health effects. Letcher warns that just because there is not a clear health consequence, does not mean the chemicals don’t threaten human health. “There are subtle ways in which these foreign substances in our bodies may be manifesting themselves and it’s not completely obvious,” said Letcher, who is also a professor at Carleton University in Ontario. Researchers believe the chemicals will eventually impact people because the chemicals attach to proteins and proteins run major systems in the body. The most important questions, according to Delaney, are how much PFCs can our bodies tolerate and are the levels we see in nature and in humans dangerous? “From my point of view, they look really suspicious as a contaminant that’s having an actual effect on us and our health,” said Delaney. Most PFCs and the products they are in are no longer manufactured in the U.S., but they can be outsourced to other countries and shipped back. Not only are the products making their way back into the U.S., approximately 1,000 to 3,000 new chemicals come into the market every year with no toxicology testing, Delaney said. The only chemical that has shown a decrease in the herring gull population is known as perfluorooctane sulfonate, the chemical created by the 3M Company in 1949 and phased out in 2002, according to the study. However, it remains the most highly concentrated single compound in herring gulls of all the contaminants. Researchers believe PFCs should receive more awareness because new chemicals are being induced into the market every year. Herring gulls are passing the contaminants on to their young and traceable levels are in the general human population, according to the study and Delaney. The lack of responsiveness and concern about the problem worries Delaney. PFCs in the Great Lakes Basin on Dipity. Moody, thank you for your comments. I really appreciate your thoughtfulness, thoroughness, and intelligence. Please keep up the good work. I enjoy seeing people like you post comments because I always learn from them. Thanks! I can hear the frustration and anger that many of you expressed about what is going on. I can certainly appreciate your feelings. But know this, there are still a lot of good people in business and the government. And I have a lot of respect for the people that are coming up behind us where I work. They don’t get the press and they don’t have enough influence, but even in this issue, there are lots of people working to figure out what is going on. As I mentioned above, US companies voluntarily quit making some of the more dangerous PFCs. The current political and litigious environment does make it harder to address this type of problem and the science is very complicated which makes it hard for the public to rally and demand action. Still, just the comments on this page show that there is still plenty of talent and people who care. And although this should be no comfort, the super rich have a stake in this as well. They have higher levels of PFCs in their blood than the poor and they have higher rates of autism in their children. Money + a problem = action so I figure it is only a matter of time before this becomes a national issue. Mike, That was pretty much an ad hominem attack showing a lack of humility and knowledge. You have talent but without humility to go with it, you will just be part of the problem and not part of the solutions. Go to Google Scholar and look up Perfluoroalkyl and toxicity. Check out the C8 project on the web. I think there are some major corporations that wish the stuff wasn’t toxic. Additionally, no one has regulated PFCs out of our manufacturing. The 9 major producers in the US voluntarily quit making them and many manufactures are avoiding using them. You can also check out what Europe is doing. The EU has banned certain PFCs already and you can find out why by checking into the “Stockholm Convention.” Of course to do this kind of fact checking entails work unlike shooting off funny one liners to insult people that know a lot more than you, so it will take character and humility to do it. Good luck and I hope for all of us that you put that talent to work in a good way. Ray, Excellent question. PFCs or Perfluoroalkyl chemicals have some very unique qualities. They repel both oils and water, thus they get used in lots coatings and fabrics to give them the ability to repel moisture and grease and fats (think Scotch Guard and Stain Master, just examples that most of us are familiar with, but there are a limitless number of products using PFCs). Thus they were used a great deal in consumer products and much of your food has been wrapped in paper treated with the stuff. Additionally, these chemicals are as close to indestructible as anything man as invented. Thus, they are used for equipment that needs to survive in very harsh environments. The aerospace industry uses them in many applications. Your car has them in the forms of gaskets and probably your synthetic oils. They are the slipperiest substances known (think Teflon). They are literally in thousands of products that we all take for granted (floss, soaps, waxes and polish, etc.) They are used in the metal plating industry, semiconductor manufacturing and building materials. There are around 400 PFCs. They all share one thing in common, they are all virtually indestructible in nature. And they were thought to be totally inert. Given their seeming non-reactive nature, it was not surprising that many forms of PFCs were thought to be totally safe. Turns out, they may be as toxic as PCBs and Dioxins, but much more pervasive in our lives. A local chemical company made yellow dye, but it caused cancer. They changed one atom, thus changing the name and this made it legal again. Where does it stop? This is not a matter of Republicans and Democrats. It is a matter of greediness the CEOs and share holders of companies. They hide the harm done because they really are not as exposed to those contaminants as the bottom 85% of the population. They want to do away with the EPA and they just misinform. Republicans are the most affected because of their strong believe in the erroneous capitalism. They equate freedom with capitalism. That contaminants are bad for the human population as well as for wild life does not need any proof. We can see how it has affected. Cancer among humans have increase in spite of the research efforts of the Scientific community. Bees have disappeared and the numbers of some reptilian species have decreased enormously in the last 10 years. In rural Ohio the water has become flammable. (Gasland Documentary). The produce we buy at the markets do not go into seeding and those who do their seeds are not viable. Monsanto owns most of the patents of the seeds we need for sustenance of our flora. So, lets all brace ourselves, something wicked this way comes and it is approaching quickly. I’m not in favor of toxic chemicals. I never met a PCB that I liked and DDT and I have never been friends. I’m not even all that fond of Sulphur Dioxide or Benzene. But I’ll admit to using, needing, wanting and even being happy with many other chemicals and things made from them – even ominous sounding ones with “initials” instead of names. This PFC substance and the above post has me a bit confused. Compared to chlorinated hydrocarbons, it’s not persistent. A PFC used from ’49 to ’02 (over 50 years) is already declining. So we have a compound that seems to be quite handy being regulated out of existence because it has a scary name. Evidence is it will quickly (in chemical persistence time)be eliminated in the environment – except for foreign manufacturers will still be able to benefit from using it. Still, there are no studies showing it’s toxic to begin with. Herring gull populations are stable or increasing. I’m thinking we have a government researcher, scrounging for tax dollars to fund research to look under the bed and he’s finding only dust bunnies. “…Chemicals used for more than 60 years in paper, carpet, furniture, clothing, cardboard and Teflon are showing up in the eggs of Great Lakes birds, according to a recent study…” OK, I give up. WHY did they use them? WHAT process was so important that all these things had to have these chemicals added to them? This isn’t about how stupid we think they are, it’s about how stupid they think we are! Since they conisider us stupid, (because we couldn’t possibly understand, the ramifications of doing the right thing) we get to watch. Good question Harold. Personally I believe that Repug politicians don’t give a damn about the average American. By average I mean average income, since they are in the 1%; average intelligence, since they think of themselves as well above; average ability, since they feel their’s is far above; average achievement, since they think they are over achievers. Besides, their masters, corporate Amerika, want it this way, no regulation, no oversight, no penalties, no onus, only profits. Since Republicans want to do away with the Environmental Protection Agency, poly- and perfluorinated compounds (PFCs) and other toxic chemicals must not be a problem anymore. We all know how scientifically minded our leading Republicans are nowadays. They wouldn’t put the wealth of corporations over the health of humans, would they?